Dearly Beloved, we are gathered here today not to praise IE6 but to bury it. Microsoft released Internet Explorer 6 on August 27, 2001, almost exactly nine years ago. Since then, it has been superceded by not just one but two separate versions, and IE9 is near release. IE6 has at least 23 unpatched, serious security holes in it – Microsoft has no plans to correct any of these and these holes may have resulted in serious security breaches at Google reported in early 2010. Furthermore, IE6’s old age means it lacks support for many of the features that make it easy to develop powerful and sophisticated web applications – this means that when we release a new version (which we do twice a week) we need to do extra work to get PBworks to function correctly with IE6. Now that IE6 usage is finally (well) below 5% of our userbase, we’ve decided to formally retire our support on November 15, 2010. On September 15, 2010, all IE6 users visiting our site will receive an in-product message alerting them that they have two months to upgrade to a more modern browser. We strongly recommend Google Chrome 5+, Safari 5, or Firefox 3.6 for cool features like drag and drop file uploading, although we do also support IE7 and IE8. Opera users – yes, we make a best effort to work well! On November 15, 2010, all IE6 users will be redirected to our mobile site; this will ensure that they are still able to consistently and correctly access their data but to use our more advanced technology, users will need to upgrade per the above. I do a lot of cross browser testing as part of my job as Gentleman of Quality (Head of QA) here at PBworks and I keep a close eye on which browsers our users are adopting and which ones are fading away. I’m pleased to announce that we’re adding support for Google Chrome, an excellent browser that is rapidly becoming the standard for high performance on the web. In addition I’m glad to see the vast majority of Firefox users have upgraded to the latest version of that browser. If you haven’t done so already (and just over 1% of our users have not) please take a moment to upgrade. PBworks will no longer fix bugs that appear exclusively in Firefox 2. Modern browsers are faster, more secure, and much more helpful. We understand there are a number of you who are still forced to use ancient, dangerous, and painfully buggy browsers such as IE6, but overall the adoption of new browsers has been surprisingly quick. At PBworks, we take our data seriously. So it should be no surprise to learn that we use A/B testing techniques to aid our product and website development decisions. Having a web-based product means that we can quickly learn what our customers like and what they don’t like and make changes accordingly. If you’re not familiar with A/B testing, Avinash Kaushik has a great primer. In the chart, each day shows the cumulative conversion rate (i.e. total sign ups since the beginning of the test divided by the total visitors since the beginning) for the test site (Test) and the current site (Control). Notice how well the test site is outperforming the current site. However, anyone who’s played games of chance can tell you numbers that look good on this turn, may not be so hot on the next. For example, if you flip a quarter 5 times and it came up heads 4 times, would you feel confident on betting that the coin is biased towards heads? What if you flipped 80 heads out of 100 tosses? At this point, you’d be much more confident that the coin is biases towards heads. In our A/B test, we measure the conversion rate for a small subset of all visitors, let’s say 10,000 visitors with 100 sign ups. Do we believe that the this conversion rate will be the same for the millions of visitors we expect in the months to come? Do we need to test 1,000,000 visitors to be confident that the observed increase will apply to all visitors and was not just the luck of the draw? Statistician have figured out a way to calculate a numerical representation for the confidence that the population (i.e. the millions of visitors our site will see in the future) will show an increased conversion if the sample (i.e. the thousands of visitors that have hit the test site so far) shows an increase. Though we have this reliable, albeit complex, formula for the confidence number (using a 2-proportion z-test, or an online calculator), explaining what this number means to the rest of my team hasn’t always been easy. How would you interpret: “We saw a 30% increase in sign ups and we’re only 90% confident there is an increase.” What this means is that if we ran this test 100 times, we’d expect in 90 cases to see an increase (though not necessarily a 30% increase) and in the other 10 cases to see a decrease or no change. For some organizations, this would be enough confidence to make the test site the actual site for everyone, for others, it wouldn’t. The decision of what confidence level to use comes down to a trade off of speed and certainty. Unlike coin flipping, though, recreating the experiment over and over again would take too long and negate most of the gains we expect from A/B testing. So it is difficult for some to internalize what this confidence level represents. Many people, especially those that are risk-averse, don’t like dealing with probabilities and will keep asking for more data. But you’ll never be 100% certain that the test site is better converting than the current site. So at some point you need to stop collecting data and make a decision. 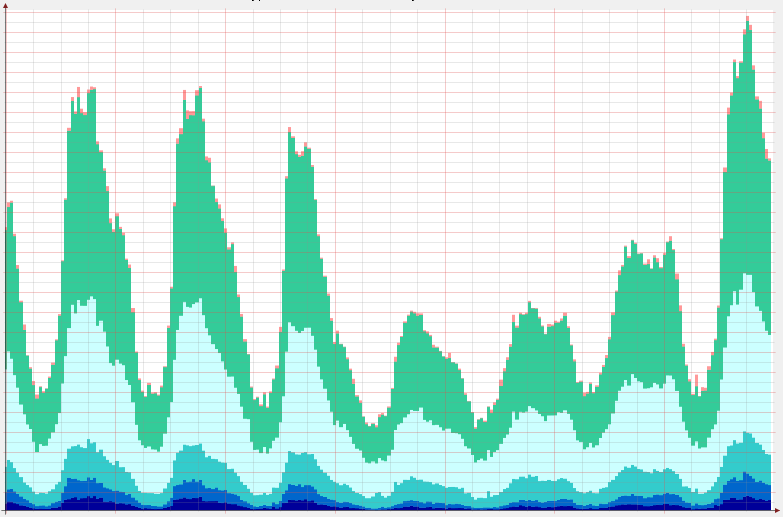 My team has dubbed this a “Sunrise Chart” (yeah, I’ve never seen a green sky during a sunrise either, but you get the picture). The solid black line and dashed blue line are the same as in the previous chart and the colored bands represent confidence levels. If the test line veers into the green area we have a 90% level of confidence that the test site out-converts the current site. Many of the less technically-inclined members of my team find that this chart makes sense on a more intuitive level than a statement like: “We saw a 30% increase in sign ups and we’re 90% confident there is an increase.” The chart shows this same information, but it also shows two other things. First, the random day-to-day fluctuations in conversion rate average out and the rates stabilize over time. When people see more stable conversion rates, they are more inclined to feel confident in the difference they see. Second, this chart shows that as we collect more data over time, a smaller and smaller increase is needed to reach a specific confidence level. This is essentially the same piece of information as seeing the conversion rates stabilize, but since these confidence bands are generated from a complex mathematical formula, it gives some peace of mind that the underlying math is jibes with their gut. To wrap things up, at PBworks we believe that A/B testing is an important tool to develop the most relevant software for our customers. However, when experimenting, it is not enough to simply compare the conversion rates of the test site with the current site. We want some level of certainty that if we do see an increase, it is not simply due to a lucky draw. That is where confidence levels come into play. Finally, and perhaps most importantly, it’s not enough for just the technically inclined to “get it” with a statistical analysis of the results. Rather the whole team needs to be on board with the decisions that result from the experiment, so everyone needs to be comfortable with the analysis. This is when Sunrise Charts can be a valuable aid. New Feature: PBwiki Has Spellcheck! Yes it’s been a long time coming but today we’re thrilled to announce — PBwiki now comes with spell check! To double check your spelling, click on the spell check icon in your toolbar (beside the plugin icon). All misspelled words will be underlined with a dotted red line. Right click on the word to view suggested spellings. We love feedback, let us know what you think! I joined PBwiki last month as the first web analyst on the team. One of my key roles here is to analyze how people interact with their wikis so that we can craft our products and services to best meet your needs. One of the greatest facets of having a “software as a service” (SaaS) model is that we have an on-going relationship with our users and can observe how they interact with our product. Compare that to the standard shrink-wrapped software model, where the vendor sells the product and then disappears from the customer’s sight until they want to sell an upgrade. The benefit, of course, of us knowing how you are using our product, is that we can enhance the product to better suit your needs. Case study: How many users use Document Management functionality? As a concrete example of how PBWiki analyzes user behavior to improve the value of our product, let’s look at our new Document Management capabilities. On any given day earlier in October, roughly 35% of active wikis were uploading files (see table 1). This adoption rate indicates that you find document management useful and that we need to focus product development effort on it. But at the end of the day, this number doesn’t give us much guidance in terms of what direction to take this feature. To make any decisions regarding the product, we also had to look closely at qualitative data. The quantitative data (i.e. the 35% adoption rate) lets our product team know what you’re doing, but the qualitative data lets us know why you’re doing what you’re doing. After analyzing the qualitative data (e.g. user feedback), we realized the need for several new features (including access control), implemented them, and pushed them live near the end of October. So, how do we know if these new features were useful? We monitored the adoption rate and saw it jump over 10% (see table 2)! The upshot of this example is that at PBwiki, we listen to our users so that we can build the best products to solve their needs. If you mark your wiki private, we’ll keep it private. We don’t share personally identifiable information with others. We hate spammers, too. We’ll try not to bug you with email. During any analysis, I will be sifting through the 1 billion events that our users have generated over the past few years. Because of the immense size of our data set, I work with anonymous and aggregate data. In the analysis of Document Management above, I included over 100,000 wikis and at no point did I need to drill into the specific details of any one wiki or user. What kind of data would you like to see? When you think of taking a vacation cruise, you probably think of all the food you’ll eat, shuffle board you’ll play, and booze you’ll drink. But what do the folks running the ship think about? My bet is they think about some of the same things I think about everyday: keeping the ship operating smoothly, charting a halcyon course, and making sure that process never enters the minds of its customers. Come with me for a tour of the ship we pilot for the pleasure voyage we like to call pbworks.com. “Safety first” isn’t just the mantra of cruise liners and middle school crossing guards, we take it seriously here, too. Your data is kept on three different PBwiki machines, then additionally encrypted and backed up off-site. How much data are we talking about? Your average desktop computer can hold about 200GB of data, of which about 6GB is your illegal music collection. We track over 25 times that amount: 5400GB of your data. In the past year we’ve had to triple the number of servers we use to store it all! Engines are pretty important to cruise ships, but they’re also complicated and can break down. Putting in multiple engines is difficult and expensive, but it’s worth it: if one breaks down, you’ve got a spare. PBwiki is the same way with computers. Over the last year, we’ve worked to add “hot standby” servers that automatically take over if another computer experiences a failure. Ever wish you could just switch computers when Word or Windows crashes and pick up where you left off? With PBwiki you can! Captains don’t drive a ship blindfolded, and neither do we. Earlier this year we fully instrumented our machines and services with a program called “ganglia.” It takes measurements and displays them on our dashboard so we can detect problems and calculate trends. 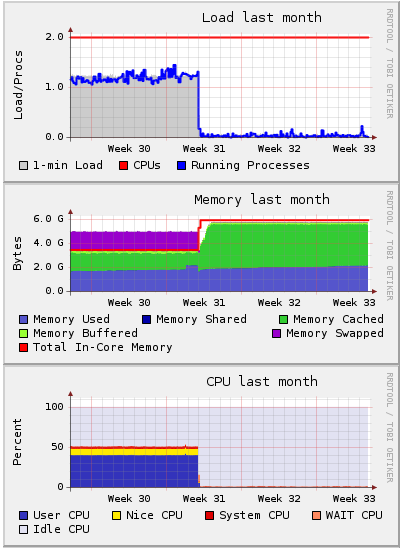 The graph at left shows the effects of adding RAM to a beleaguered backup database: CPU usage drops and we are even more prepared in the unlikely event of a problem. Of course, this metaphor only goes so far: I haven’t yet secured the right to use deadly force to suppress piracy and mutiny. Apparently that would be against the “laws” and we haven’t relocated to my ideal office in international waters. Join me next time when we go into more technical details about PBwiki’s commitment to operational excellence!